This is a modified cross-post from ebooks, but perhaps more of an Android question since Kindle Fire runs on a bespoke Android build. I have a Kindle Fire 8 (7th gen) running on Fire OS 5.3.6.4, which I believe is the same as 5.6.3.0, just misnamed. The underlying Android build for this is Android 5.1.1 Lollipop. I use RescueTime on my MacBook and Chromebook to log my on-screen activity, which has been tremendously useful. Unfortunately, while there is a native Amazon app for RescueTime, it is not compatible with any recent-generation Fire. 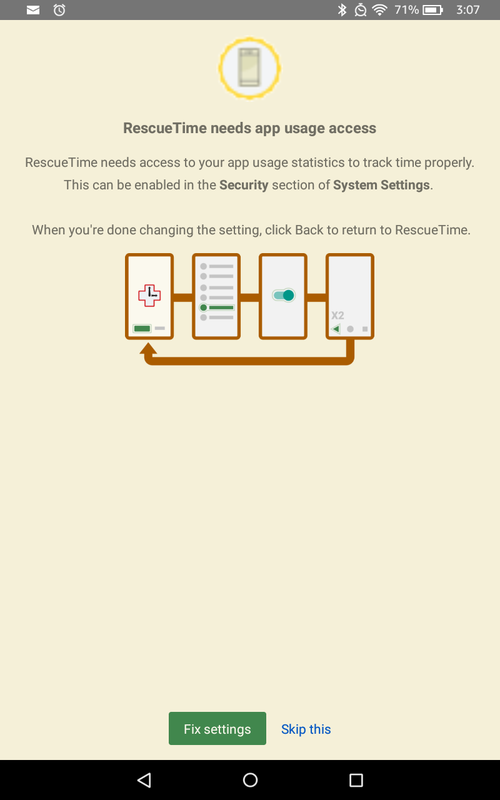 So I tried installing RescueTime on my Fire two different ways: First, through an APK, and the through Google Play, which I use for common apps not available through Amazon like WordFeud. I've got through the Fire's settings ad nauseam without luck. I see a "Device Administrators" option under "Security & Privacy," but when I open it I don't have any options to enable specific apps. All it offers is "Find My Device" and "Google Pay." Is there any way, besides rooting the Fire and installing a native Android build, to allow apps to access the more generic Android-level permissions? I don't mind rooting the device -- it's out of warranty -- but would prefer not to switch the OS entirely. Thanks! Browse other questions tagged permissions apk google-apps amazon-kindle-fire or ask your own question. eBooks from Amazon Market or from Android Market?